Today’s feature travel photo from Asia is shot of the panoramic views I had of Bangkok from high atop the Golden Mount Temple Wat Saket in Bangkok, Thailand. Although some would claim the best views of Bangkok are from the downtown area, my favorite vantage point is from Wat Saket or Wat Arun. 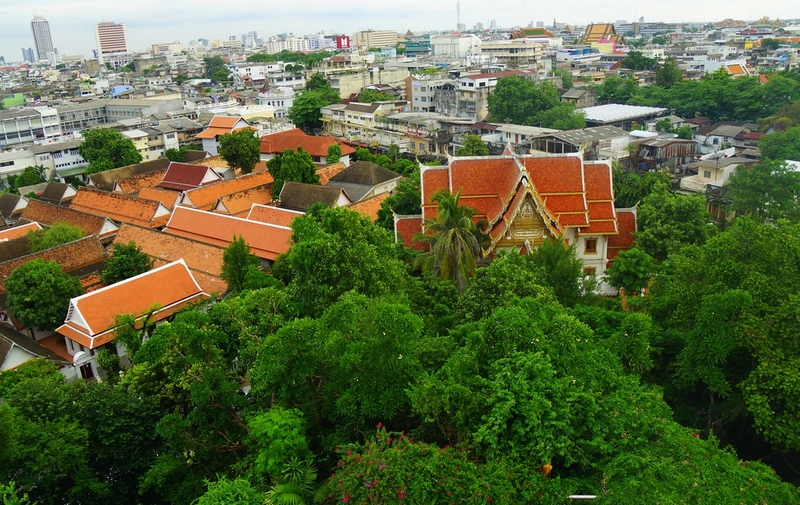 From here, you have more of a view of lush greenery and traditional Thai homes as opposed to the urban concrete jungle. On this particular day, the Golden Mount Temple was packed given it was a Buddhist religious holiday in Thailand. In order to grab this shot I had to be patient and wait for an opportunity to wiggle my way against the side of the wall. Sometimes it can be hard to be patient but it’s well worth it. To view more photos from my recent trip to Bangkok click on the picture above. This is an awesome panorama of the city. Well done!